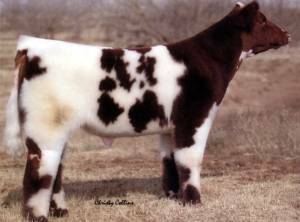 Talk about a stylish, hairy, cool fronted Shorthorn; Storm Chaser's got enough to share with all the competition. With the Shorthorn breed gaining momentum, faster than a runaway locomotive, roaring down a mountain, it's time to get on board and share in the movement. Don't delay; order today! Take the Storm to the competition!